While banner ads are definitely not as popular as they used to be in the modern marketing world, there is no way to deny the fact that they are still important. It is not at all difficult to find some opportunities that are very good for the marketing campaign that one wants to prepare. However, this is only possible in the event that you understand the target audience. 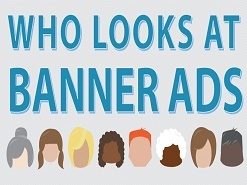 Everything starts with the question “Who Looks At Banner Ads?” and the infographic is a great place to start. The stats that are offered by the infographic are definitely interesting. One of those that many are surprised about is the fact that average CTR (click through rate) is of 2.1%. Many think that this is incorrect but it is true reality. Not a lot of people are actually going to click those ads. That is why many of the campaigns cost so much and investments are high until the formula for success is found. Make sure that you take a look at the section that talks about why people click on the ads that they see on a page. You will notice a clear connection with products/services. On the other hand, the reasons why people do not click on banner ads is quite a lot longer than why they do click on the ads. It is enough to say that 61% of people do not click on ads because of the fact that they do not want to be distracted. Simply put, they just do not care about advertising. The one section of the Who Looks At Banner Ads infographic that is particularly interesting and funny at the same time is the More Likely To. It talks about different events that are more likely to happen than having one person click on an ad. You will be both surprised and amused by the fact that you are much more likely to get accepted to Harvard or Survive a Plane Cash than to click a banner. The odds to survive a plane crash are 475.28 to 1. Take a quick look at the stats and have fun or learn some interesting things in the event that you are an internet marketer.